With Easter coming up, I wanted to create a nice side dish for dinner. Carrots are a natural fit for the menu! For spring, however, I wanted to do a lighter take on the flavors and add some fresh herbs and a touch of citrus for the end of citrus season. Fennel pairs wonderfully with the carrots, ginger, citrus and mint in this dish. New potatoes round out the root vegetables here and balance the sweetness. One element that separates "easy" dishes from restaurant versions is that often restaurants prepare each component of the dish separately, then combine. That way, everything is cooked to perfection in the final dish. A steamer basket, or electric steamer can help a home cook get the same result easily. Steaming the harder vegetables first, then roasting gives them a crisp, caramelized surface, along with caramelizing the thin slices of fennel — without the risk of burning. Steam the potatoes for about 30 minutes, or until fork tender. Place on greased baking sheet to cool. Steam carrots for 20 minutes. Slice the potatoes in halves, lengthwise. Add carrots to the baking sheet. Spray lightly with the organic spray oil. Salt and pepper to taste. Spray a second baking sheet. Add the thin slices of fennel. Spray lightly with oil. Salt and pepper to taste. Place both trays in the oven and set timer for 10 minutes. Put the carrots and potatoes on the top rack. While the vegetables are roasting, place the lemon, ginger, butter and honey in a small sauce pan. Melt the butter, whisking to combine. Bring to a simmer and whisk occasionally until sauce is thickened, about 10 minutes. Add the zest, coriander and salt and pepper to taste. Keep warm on stove. Check the fennel when the timer goes off. It may need to be turned so it caramelizes evenly. Check potatoes and carrots, turning the carrots and potatoes if needed, to brown all sides. Roast another 10 minutes until a lovely golden brown. When everything is done roasting, place the carrots and potatoes on a platter. 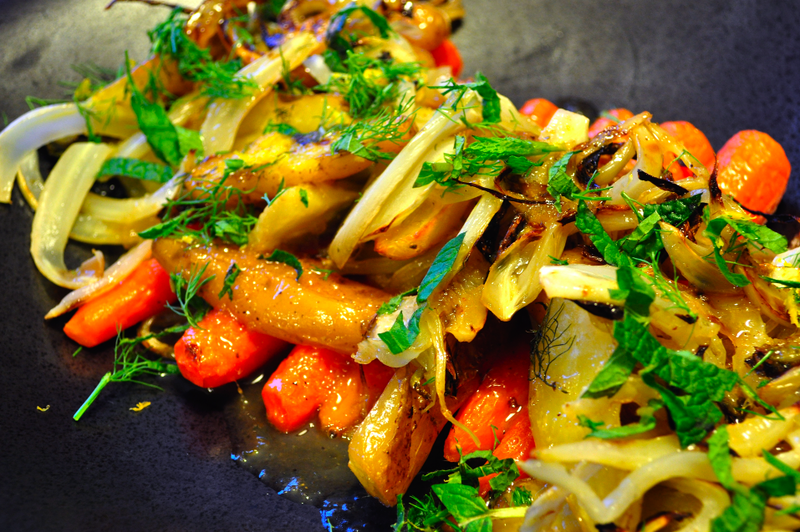 Place the fennel on top. Drizzle on the sauce and garnish with the reserved fennel fronds, fresh mint and parsley. This will pair beautifully with ham or a lamb roast. This post is the second in a series from an interview with Dr. Ramasamy Manikam, PhD, a clinical psychologist and top expert on feeding disorders with over 20 years of practice. Dr. Manikam is the Director of the Center for Pediatric Feeding Disorders at St. Mary’s Healthcare System for Children. Compared to most of us parents, Dr. Manikam has experienced far more challenging situations at mealtime than what we face at our own tables. He is also a parent and grandparent. In this post, he shares his experience and perspective for all parents, including how to deal with “picky” eating issues such as color, texture, food jags and other common food concerns. First, the most important message for all of us parents is that minor food issues — such as typical “picky” eating — are perfectly normal. The other important advice is we shouldn’t worry so much about food that we cause a larger problem. Another good thing to remember, Dr. Manikam advises, is not to get hung up on your child “having” to like any one food. Food should not be a fight, Dr. Manikam, advises, which is perhaps the best message parents could hope to hear. For those of us who deal with the challenges of our kids’ food issues daily, however, Dr. Manikam offers some good strategies for how to solve the issues and avoid that conflict. So, what about particular issues, such as a food jags where a child refuses to eat anything besides the Evil Trinity of fat-sugar-salt, i.e. mac-and-cheese, fast food or chicken nuggets? Many of the same approaches for food jags, above, are also useful for a color aversion, says Dr. Manikam. Texture issues, whether it is a preference for crunch or for soft textures, can be confusing since they show up across all different flavors and colors of foods. For kids with texture issues, Dr. Manikam advises parents to try and evaluate the source of the issue in case it is not just picky eating. “Check to rule out oral-dental problems. Rule out sensory issues. Texture fading (gradually increasing the texture of the food presented moving from puree to thickened puree) is a strategy that works well most of the time in the absence of oral-dental and sensory problems,” he says. Some of us have kids who can't seem to stay still long enough to eat. These kids are often slumping in their chairs, getting up and down, or won't want to eat a full meal but then say they are hungry an hour later. For these eaters, Dr. Manikam recommends a consistent schedule and being aware in case there are legitimate causes of a small appetite. Feeding a family with all different tastes can be a struggle. It’s tempting to give into the request for separate foods — even just to get through one difficult evening. Once this becomes a habit, some children may insist on always being fixed a separate meal of foods they request. What started out as an understandable quick fix solution for a busy and stressed parent now adds to daily stress with the extra planning and preparation of this separate meal. How do you get the whole family eating the same meal again? “If the child is healthy and well developed a ‘premack’ strategy can be used (i.e., to have the child consume a bite or two of the family food before presenting the preferred food and gradually increase the amount of the family food); or have the child leave the table and tell the child he/she can eat at the next meal (do not deprive the child of other food routines between mealtimes including liquids and snacks). If the child is not healthy or cannot afford to lose weight then food fading (gradual introduction of small amounts), food masking (mixing and hiding with other foods), and premack strategies can be used, ensuring that the child gets the required calories and nutrients,” says Dr. Manikam. How Do We Tell if a Food is Disliked Because of Color, Texture, or Flavor? Younger children cannot always verbalize their exact issue with a particular dish. It doesn’t help that one recipe for carrots can taste completely different than another recipe. How can parents of younger children “crack the code” on why their children won’t eat a particular food? Overall, Dr. Manikam offers advises parents to remember, “Every eating ‘quirk’ is not a feeding disorder. If the child is healthy with normal growth trajectories the ‘feeding issues’ are overcome through ‘common-sense’ actions and time." He also advises us to simply enjoy our food as we introduce small bites of new foods to our children. Reintroducing a rejected food item is a good tactic. That small bite might get eaten after a few tries — just don’t force those bites, he says, or force your child to clean his or her plate. If you find yourself still tempted to worry, focus on being sure your child’s menu is varied and provides adequate nutrition for his/her age and developmental needs. Many thanks to Dr. Manikam, Director of the Center for Pediatric Feeding Disorders at St. Mary’s Healthcare System for Children, for his insights shared here. Read the first post in the series on feeding disorders and when a parent should worry. Expert Interview: What is a Feeding Disorder and When Should a Parent Worry? Have you ever wondered if your child’s picky eating is “normal?” If so, you’re not alone. The next couple posts will be a series from an interview with Dr. Ramasamy Manikam, PhD, a clinical psychologist and top expert on feeding disorders with over 20 years of practice. Dr. Manikam is the Director of the Center for Pediatric Feeding Disorders at St. Mary’s Healthcare System for Children. Dr. Manikam has been kind enough to answer some questions for me. The first post will cover some background on what feeding therapy is and what conditions are most often related to a feeding disorder. The posts will also cover when a parent should — and shouldn’t — be concerned about a food issue. The second post, for those of us who are blessed with kids who are just “picky eaters,” Dr. Manikam shares some of his perspective as a medical professional as well as a parent and grandparent on some of our “common” food concerns with our kids. What is a Feeding Disorder and When Should a Parent Worry? A genuine feeding disorder can be devastating. The symptoms, causes and actual behaviors of a food disorder vary. However, one constant is that dealing with a child’s food disorder can be especially hard for parents who blame themselves for the disorder. Some parents I’ve talked with have children with eating habits that cause both the parents and children in these situations to dread daily mealtimes. Their children may gag when eating a disliked food or have another type of adverse reaction to some foods. Situations like this feel anything but "normal." Where is the line between “picky” and when there may be an actual disorder? When should a parent seek medical help? Growth and development issues are gradual symptoms, but there may be short-term indications of a food issue as well. “Weight loss, illness, allergy, crying during meals due to pain, etc. should be a call for medical evaluation to determine the nature of the problem,” says Dr. Manikam. Other symptoms that can be indicators of an underlying medical problem include; difficulty with swallowing, vomiting during and after meals, choking and gagging during meals, poor appetite, and crying while holding the stomach. “[These signs] can be indicators of an underlying medical problem that should be evaluated by trained and experienced medical professionals,” he continues. The causes of a feeding disorder are most often a medical condition. Less commonly, a feeding disorder develops from inappropriate interactions with a parent. Feeding disorders affect approximately 25-40 percent of children from newborns to adolescents, a statistic that seems alarmingly high. 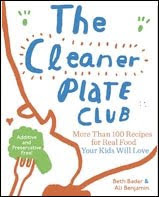 • Food allergies, including milk allergy, and lactose intolerance. Other physical causes may include gastroesophageal reflux (GERD) and Crohn’s disease. Sensory disorders, autism, and ADHD can sometimes be linked to food issues. Only about one in ten food disorders are caused from behavior issues. These food disorders can be caused by negative interaction with a parent. Examples Dr. Manikam provided include a parent that has low tolerance; has a poor understanding of developmental norms; or has been affected by the knowledge that other children were doing better or eating table foods earlier. Other negative interactions can include a parent who cannot read his or her child’s hunger cues, or who forces food on a child when the child is not hungry. Parental aggression or anger during feeding times, a lack of nurturing, and parental apathy are other negative parental interactions that can lead to a feeding disorder in children. How Are True Feeding Disorders Treated? Treatment for a true feeding disorder can require an expert such as a feeding therapist. Dr. Manikam is a clinical psychologist, but feeding therapists may have different backgrounds. Feeding therapy, in some cases, requires a team of individuals with different specialties. “Feeding therapists are professionals trained in the assessment and treatment of individuals with feeding problems. Generally, Speech Pathologists, Occupational Therapists, and Behavioral Psychologists provide feeding therapy services to individual with feeding problems,” says Dr. Manikam. Feeding therapy team members may sometimes include a nutritionist, or a social worker or other medical professionals. The therapy process may focus on the patient only, or the parent, or both. This article on Dr. Manikam from the New York Times, has some specific examples of patient experiences. “Depending on the patient’s age and developmental levels and the nature of feeding problems professionals might work with the patient and/or with the guardian. For example, therapists might work with an adolescent who develops ‘anxiety’ or ‘post-traumatic anxiety disorder’ due to a choking incident. In the case of younger children, therapists might work with the child and train the guardians when an effective intervention is established. In some cases, the therapist might train the guardian to implement the intervention strategies. The model of service delivery depends on the information obtained from the assessment,” says Dr. Manikam. Many thanks to Dr. Manikam, Director of the Center for Pediatric Feeding Disorders at St. Mary’s Healthcare System for Children, for his insights shared here. In the next post, he shares his experience and perspective for all parents, including how to deal with “picky” eating issues such as color, texture, food jags and other common food concerns.